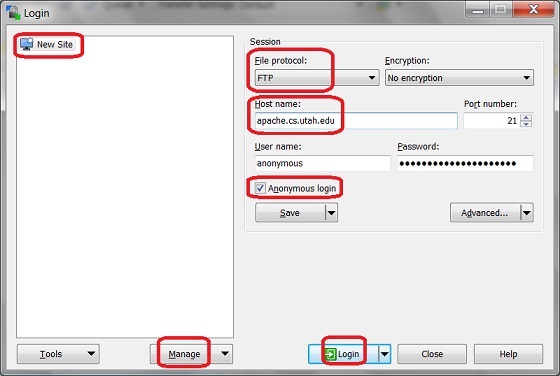 How to connect WinSCP to an Anonymous FTP Server? 2. Click "Session > New Session" menu. You see "Login" screen showing up. 3. Select the "New Site" to configure a new site. 4. Select "FTP" as the File "protocol". 5. Enter "apache.cs.utah.edu" as the "Host name". 7. Click the "Login" button at the bottom to try it. You should see WinSCP connects to the FTP server and get the folder list automatically.